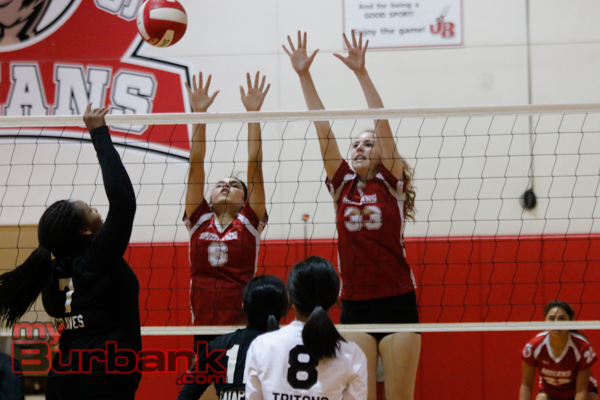 Easy became somewhat difficult for the Burroughs High girls’ volleyball team during Tuesday night’s CIF Southern Section II-A opening-round playoff match against visiting Pacifica Oxnard. 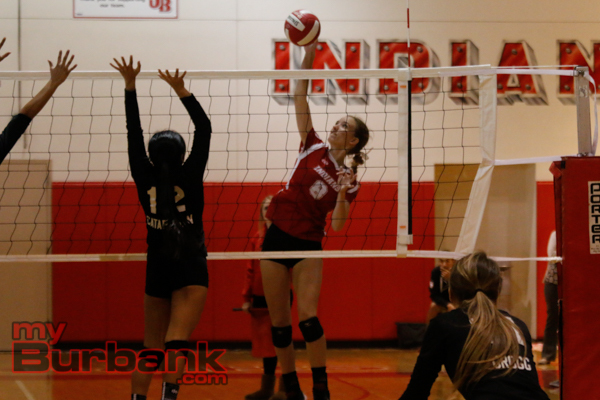 The Indians needed only three games in order to dispatch the Tritons by scores of 25-8, 25-7, 27-25, but the third game was something to behold as it see-sawed with plenty of action. 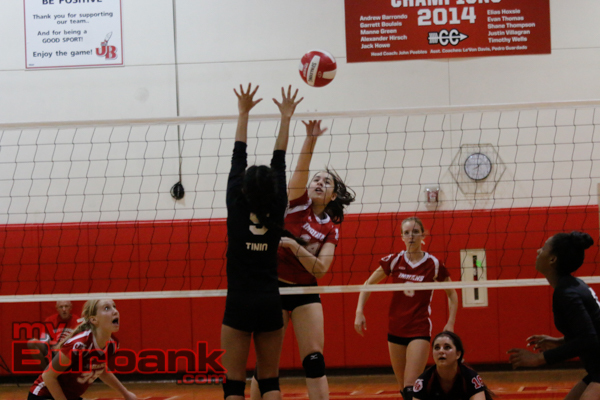 With the victory, the Indians have a second-round home match against Bonita at 7 p.m. on Thursday. Burroughs (22-7 overall and 14-0 in the Pacific League) led 3-0 in the match-clincher on an ace from senior outside hitter Danielle Ryan, but the Tritons knotted it at 5-5 on junior outside hitter Victoria Carrillo’s smash. 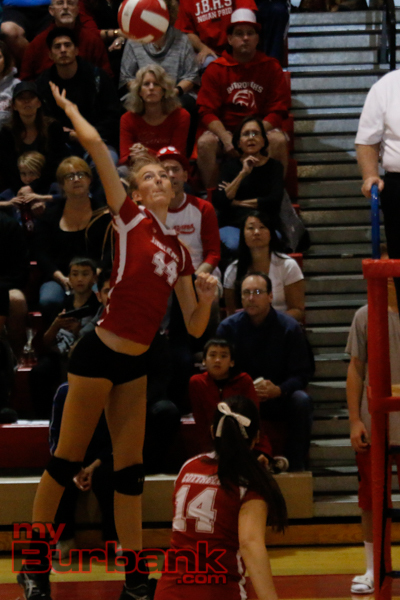 It was even at 6-6 when Burroughs sophomore setter Mia Staub’s serve sailed out of bounds, and 10-10 when Pacifica Oxnard senior setter Diana Catapussan’s shot hit the net. 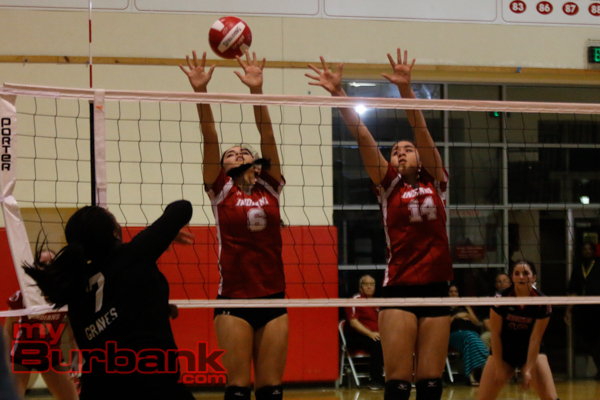 Pacifica Oxnard (14-8 overall), which closed the season with three consecutive losses, pulled ahead 15-11 when Burroughs junior middle blocker Caleigh Paster (match-best 11 kills) had a shot sail out of bounds. The Indians drew within 16-14 on senior defensive specialist Nicole Baer’s ace, but the Tritons led 21-16 on an ace from junior opposite hitter Jessica Grogg. Pacifica Oxnard bolted ahead 23-19 when sophomore setter Payton Jensen’s serve went out of bounds, but the Indians came within 23-22 on a winner from Paster. 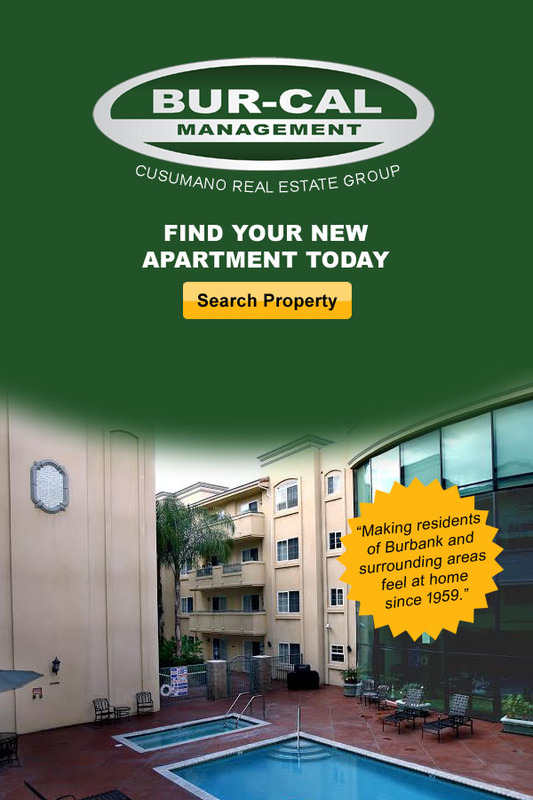 Burroughs evened it at 24-24 after an ace from Paster, but the Tritons pulled ahead 25-24 when senior opposite hitter Jessica Rury’s blast went out of bounds. It was tied at 25-25 on kill from sophomore outside hitter Julianna Cottrell, and Ryan’s smash made it 26-25 as the Tritons called time out. The game and match was secured when junior middle blocker Lynelle Tinio’s shot landed out of bounds. The Indians tallied the first six points of the initial game with points coming on Paster’s kill and combined block with Rury, Ryan’s ace, Rury’s winner and sophomore outside hitter Marin Grote’s kill. 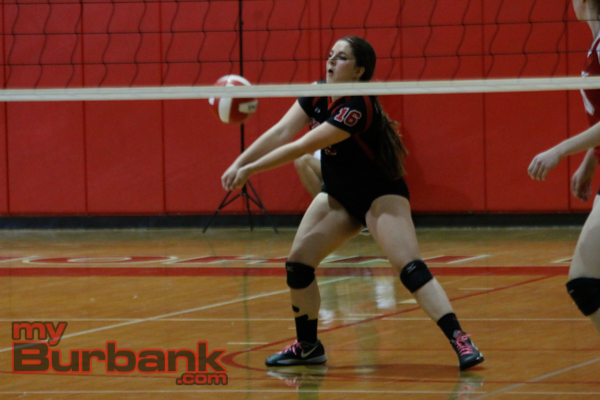 The Indians went on a 13-4 run and received points from Grote on a kill, senior defensive specialist Katheryn Dominguez’s ace, two kills from Cottrell, Jensen’s ace, a pair of winners from Ryan, junior opposite hitter Sophia Rizzotti’s kill and senior libero Samantha Sullivan’s two aces. The Indians then outscored the Tritons 6-4 as Ryan had a kill, Rury’s slam, two winners from Grote, Cottrell’s rocket and Dominguez’s service ace. 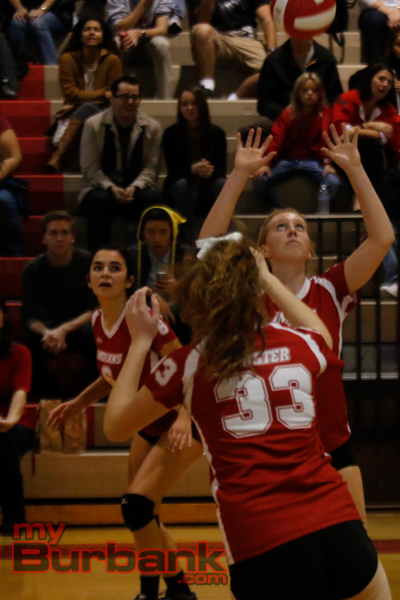 Burroughs jumped in front 3-1 in the middle game and then went on a 17-5 roll with points generated on Jensen’s ace, Grote’s two winners, Ryan’s five kills, junior outside hitter Cesera Suarez’s ace, Sullivan’s ace and sophomore setter Lauren Zedlar’s ace. The game was secured on two service aces from Ryan. 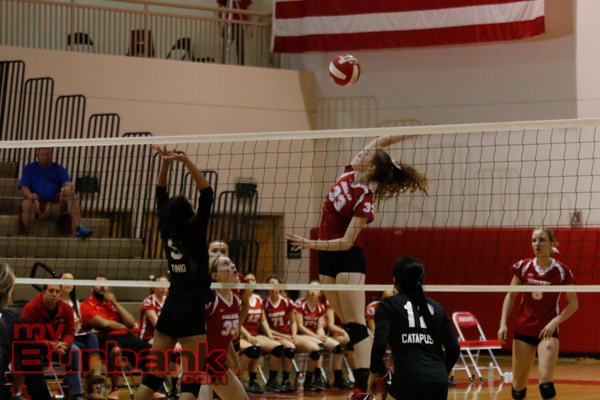 This entry was posted in Girls Volleyball, Sports and tagged Burroughs girls volleyball on November 11, 2015 by Rick Assad.